Africa's richest businessman says he is planning a bid to buy Arsenal. Nigerian billionaire Aliko Dangote believes the building of an oil refinery in his homeland will give him the finance to secure a takeover. The 58-year-old, who has an estimated wealth of £11.5bn, says he has supported the Gunners since the 1980s. "When we get this refinery on track, I will have enough time and enough resources to pay what they are asking for," he told BBC Hausa. American Stan Kroenke is Arsenal's majority shareholder, owning 67.02% of the club's parent company Arsenal Holdings plc. Russian-Uzbek Alisher Usmanov owns 30.04% with the remainder of the 62,217 shares held by minority shareholders including former players and the Arsenal Supporters' Trust, who own three. Dangote is ranked 67th on the Forbes rich list. He had previously been interested in purchasing the 15.9% stake sold to Kroenke for £123m by Lady Nina Bracewell-Smith in April 2011 only to pull out. "There were a couple of us who were rushing to buy, and we thought with the prices then, the people who were interested in selling were trying to go for a kill," Dangote added. "We backtracked, because we were very busy doing other things, especially our industrialisation." 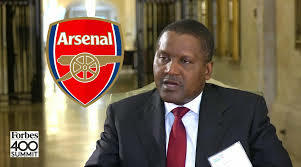 Dangote believes Arsenal require a different ownership in order to be more successful on the pitch. He added: "They are doing well, but they need another strategic direction. They need more direction than the current situation, where they just develop players and sell them."